This entry was posted on November 29, 2018 by Zoe Thomas. In this review, Opløft is put through its paces by independent ergonomist John Ridd (FCIEHF, CErg.HF. FIOSH). A few years ago it was recognised that sitting at your desk all day may not be the healthiest way to spend your work time. Interrupting your desk work with some exercise options was quickly accepted as the way forward. While this approach is great, it does not resolve the whole problem. Many workers found that as well as including exercise opportunities, they also wanted to be able to change their posture while still at their workstations. In some workplaces this was addressed by the provision of electrically (or mechanically) height-adjustable desks; however, this was not a practicable option for many companies and a simpler and more flexible solution was sought. This requirement saw the introduction of an ‘add-on’ desktop solution, whereby the standard desk could be simply turned into an adjustable height work surface, or ‘sit-stand’ desk. A number of examples of these devices have become readily available, all featuring a rising platform supporting the computer screen but with a separate keyboard shelf. This arrangement enables the user to work whilst seated when the device is in the lowest setting, but then to be able to raise it to their preferred working height when standing. 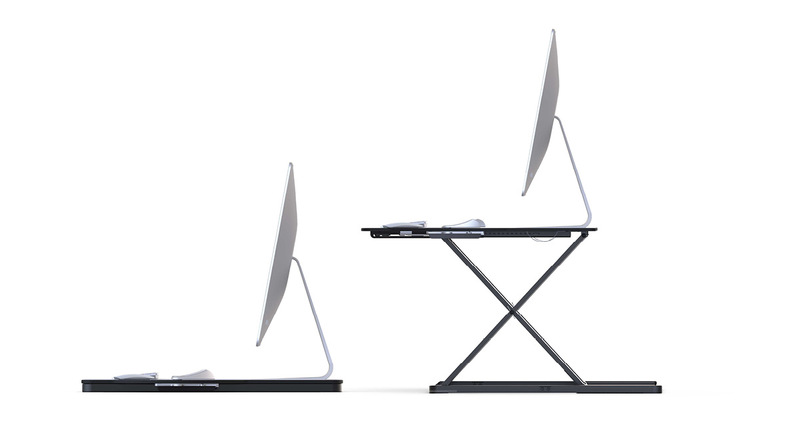 Whilst providing greater opportunities for postural flexibility, these devices are quite bulky, generally sitting above the standard desk height by between 120-150mm (≈4-5”), and although the keyboard support is at about desk level, the desk usability and appearance are adversely affected. There's now a new kid on the block - the Opløft (or uplift in English) – which seeks to reduce, if not eliminate these negatives whilst providing the same advantages, and all in a very sleek and modern design – perhaps what you might expect from something with this device’s Danish heritage. The Opløft provides a single unbroken and very usable workspace measuring 480 mm wide by 600 mm deep; this in itself is a useful space with or without a computer and hence could be used for many non-computer related activities in its own right. But it is also designed so that one or two computer screens can be attached to a pole fitted to the rear of the surface, with the keyboard used in front as one would on the desk, or for it to support a laptop or a tablet as are common and growing requirements. When placed on the desk Opløft's surface sits just 30 mm higher, which means that it doesn’t look or feel at all out of place when used in the seated position. When required, the surface can be raised to a maximum of 415 mm, but with 14 height settings (more than its competitors). On a standard desk, commonly of 720 mm height, the highest would be equivalent to the elbow height for an 80th percentile male (someone of 1820mm stature (6 ft) and >99% of females. These figures are entirely comparable with the other devices available. The Opløft is advertised as portable, and at 12 kg it is considerably lighter than its competitors (less than half the weight, depending on the model). However, because of its size I would still not consider this as a load that should be carried very far, although certainly it could be lifted reasonably easily from storage to the work surface and vice-versa, for example for intermittent use when necessary - most probably in the home-worker situation, and where its appearance would not obviously be out of place. As with most of its competitors, the surface rises in an arc towards the user, which brings the front edge forward of the base frame by up to 120 mm (this is much less than the competitors); at the height I would set for standing work the surface only comes forward by 70 mm. Nevertheless, this aspect should be considered if there is limited space behind the standing worker, but because of its design and weight, it should be reasonably easy to push the Opløft further onto the desk such that the front edge does not extend beyond the desk footprint. In order to raise the platform there are two levers shaped for thumb operation, one on either side of the surface. These are easily operated by firstly taking the tension off the mechanism by pressing lightly down, then holding the top surface and pushing the levers outwards. These separately release the brake on the spring and the locking button; as the surface rises the right hand lever can be released at the chosen height and the locking button will engage. Lowering the surface is essentially the same process, although a little weight has to be applied to push the surface downwards. This force is notable, although not overly so, and no more than for any of the alternative devices, and the required technique soon becomes familiar and relatively easy; the force is also lessened by the weight of the items that are placed on the surface such as the laptop and/or screen and keyboard. A feature I particularly like is that there are rubber flaps on either side, which reduce the likelihood of the fingers becoming trapped beneath the closing mechanism. These devices are being improved all the time and new designs are becoming available, but usually these follow the same theme; if you want to be stylish and different but need to achieve the same flexibility or even greater, then the Opløft may well be the device for you. From ‘PeopleSize’ - and anthropometric software database from ‘Open Ergonomics’. Find out more about Opløft and how it can benefit health and productivity.